It's another mid-month journey down the ol' Scraps N' Pieces blog train. And we have a yummy adventure for you...introducing, In the Kitchen. The designers and members of SNP have some delicious stops for you this month. Enjoy!! Here's my contribution - recipe tags! 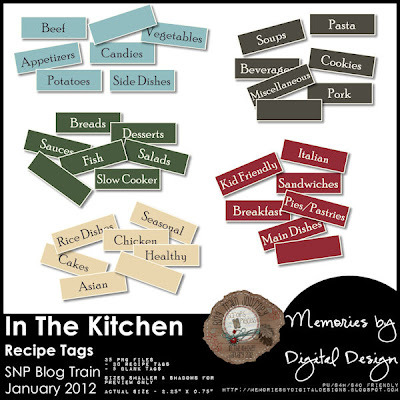 Use on your recipe layouts or print off for organizing your family's favorite dishes. Click here or image to download. Here are all the stops along the way...be sure to chew your food and don't download these with your mouth open. It'll be hard because there are some real amazing cuisines here. Lovely recipe tags! Thank you for sharing. Thank you so much for this post. I want to let you know that I posted a link to your blog in CBH Digital Scrapbooking Freebies, under the Page 5 post on Jan. 16, 2012. Thanks again.